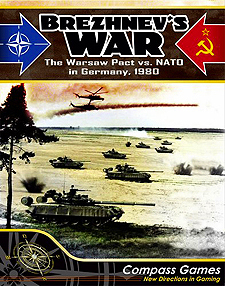 Brezhnev's War: NATO vs. the Warsaw Pact in Germany, 1980 allows two players to game the first month of a hypothesized communist invasion of Western Europe sometime between the fall of Saigon and the start of the Soviet intervention in Afghanistan. It was during that period the conventional "correlation of forces" between the two hostile alliances most favoured the communists. The system can also be easily 'fudged' for solitaire play. The scenario is the one most feared by NATO's analysts at the time. That is, they knew the Soviets understood any use of nukes or chemicals would bring retaliation by the West. That would end the war as quickly as it began - most likely along with all of civilization - with no winner. What was therefore actually feared was the Soviet units in East Germany would suddenly lunge into West Germany. It would've been a "come as you are" war, with the aim of blitzing to the Rhine - using only conventional weapons - in under a month. The Soviets would then call for a ceasefire and negotiations before any nuclear or chemical weapons had been deployed. With that, West Germany - the lynchpin of NATO in Europe - would've been neutralized and its Ruhr industrial area wrecked. That would've caused a shift in the balance of power in favour of the Kremlin, setting the up to deliver the knockout blow later. The turn sequence uses the classic fight-move or move-fight structure. Special rules account for heliborne units, Spetsnaz, the ultra-elite Soviet Eight Guards and Guards Airborne Armies, East German and Czechoslovakian disloyalty, ranged Soviet artillery divisions, air power, supply, the criticality of Frankfurt for US operations, paradrops, German territorials, electronic warfare and variable Soviet victory objectives.